$60 per person – No Experience Necessary! 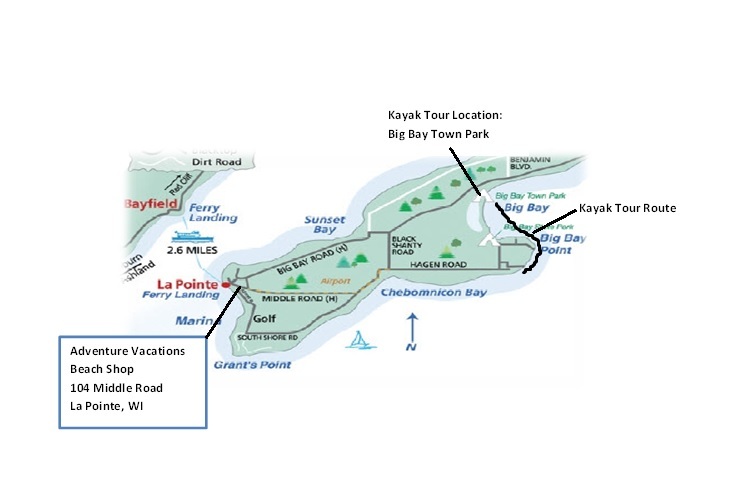 Our Madeline Island kayak tour begins at Big Bay State Park, nearly 7 miles out of the “downtown” area of La Pointe and lasts ~3 hours, with a total paddling distance of about 3 miles. When you arrive at Big Bay State Park, your guide will meet you with the kayaks ready to go and after a short introduction to the area, paddling instructions, and safety procedures, you will hit the water! 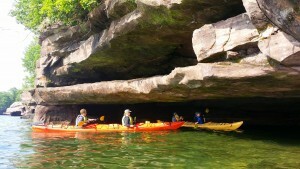 The tour begins with a paddle along the point of the State Park on Madeline Island. Once around the point you will start seeing majestic sandstone rock faces rise out of the water and begin exploring the sea caves of Madeline Island. At this time, depending on group size and weather, there may be a possibility to stop and take a short break out of the kayaks. After the break we will continue on towards the end of the State Park, then return along the coast and finish right where we started on Barrier Beach. The combined weight of kayak partners must be under 400-420 lbs (We have one kayak that can handle up to 575 lbs, please call our store at 715-747-2100 to ask for availability). The cockpit of the kayaks are 17 1/2 ” wide and 9 1/2 ” deep. It is important that you can easily get in and out of an opening of this size. Not only is excessive weight hard on our kayaks, but not being able to maneuver easily in and out of the cockpit is a serious safety concern. In the event of an emergency, our guides need to be able to pull clients out of their boats and swim them to safety. These restrictions are due to the product specifications of our kayaks, as well as safety concerns both for our clients and for our guides. If you make a paid reservation over the phone, we will inform you of this weight limit. It is very important to be honest and not to exceed this weight limit. If you show up for your reservation and you are over the weight limitations, you will be unable to kayak. If the weather is cool and you wish to wear a wet-suit, be aware that our largest size is a Men’s XXL, and that wet-suits are very tight garments and tend to run several sizes too small. Participants must be under 6’3″. Participants over 6’3″ will not be able to fit into the cockpit of the kayaks. Once again, please make sure you do not exceed any of our limitations that are specified above. 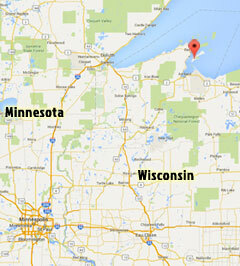 This is for your safety and for the longevity and structural integrity of our kayaks. Damage done to any kayaks due to the misuse or exceeding any limits explained will be at your expense. After you send in your registration, our email system will receive your information. We will then be communication with you through email to confirm your tour type and date. Our confirmation process includes an invoice for a 50% deposit to reserve your spot on our calendar. We will send instructions on how to pay your deposit and complete the client info section of our registration form, which provides us with physical information for each individual on the tour. This information is critical for us to ensure safety on all of our tours. Once we have received your deposit, we will send you a confirmation document with information about tour time, date, and remaining payment. The day before your tour, we will call to officially confirm the time of your tour and touch base regarding the weather on your departure date. Service on the island is spotty. If you will not be in service in the afternoon-evening of that day, please give us a call so we can be aware and confirm when you will be in service or feel free to stop in at our shop when you arrive on the island.